Taxes, taxes, taxes – what difference does it make? There are various forms of taxing the public but the three most common are property taxes, income taxes, and user fees/taxes. What makes them different and why should we care? Property taxes are designed to fund local government. The idea behind them is that those who live in the area use the essential services those property taxes fund. For example if your property is in West Clark School District, a portion of your property taxes will go to support that school district. Property taxes are assessed locally, collected locally and distributed locally. 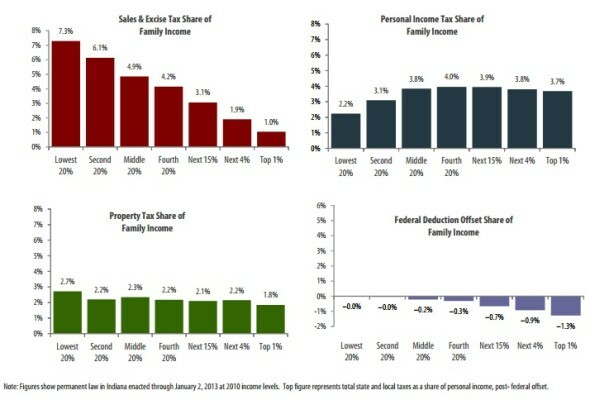 In Indiana, due to the property tax caps, real estate investors will pay double (2%) what a homeowner (1%) that qualifies for the homestead exemption will pay. Businesses pay up to a 3% cap. On the other hand, income tax is collected from payroll deductions and first goes to the state. Indiana collects a 3.4% income tax (as of June 2014) and if the county has instituted a county income tax it is collected at the same time. Currently, Clark County has a 2% county income tax for residents and .75% for non-residents. This tax tends to be regressive in nature since the impact of the loss of 2% of a lower income is felt much greater than a higher earner. It does help capture a small amount of tax from out of county residents which utilize some of our essential services. Sales tax is a form of use tax. You only pay sales tax if you purchase an item. Gas taxes are another example. You only pay the gas tax if you own a vehicle that requires gasoline. Sales taxes, like flat rate income taxes, tend to be regressive in nature. 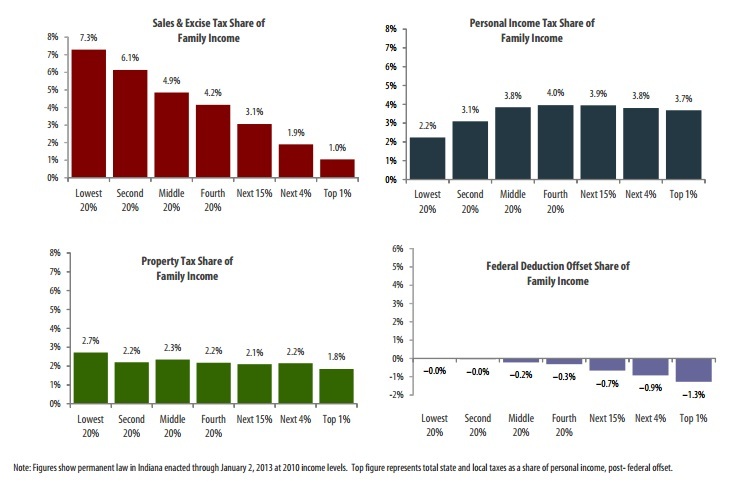 They place a higher burden on the poor and middle class when reviewed as a percentage of income. According to the Institute on Taxing and Economic Policy, Indiana is in the top 10 states with the most regressive tax burden. Who Pays? Take a look at the picture attached to this Who Pays story. The green bar chart that represents property tax shares is the most equalized of the three types of taxation. I’ll speak more on this topic in my next post. I will explain why the math involved in some of the arguments in favor of TIF districts do not add up. Yes, I’m up for re-election! Thank you Sellersburg District 1!